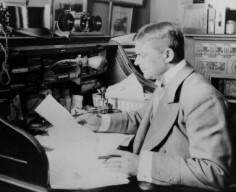 Charles Urban made thousands of films in his career. The first showed the Oxford and Cambridge boat race of 1898; the last, in all probability, was a documentary on Darwinian theory released in 1925. No complete list of all the films that he produced exists, and it would be an almost impossible task to construct one, as he re-edited and re-used his film material so frequently. The titles below are twenty of his most notable film productions, covering a period of nearly thirty years, including dramas, documentaries, science films, travelogues, war propaganda, imperial pageants, industrials and natural history films. Not all survive in film archives today; in particular, only a handful of Kinemacolor productions survive as illustration of what Urban felt was his greatest contribution to knowledge and entertainment. Charles Urban's greatest achievement was the spectacular Kinemacolor record of the 1911 Delhi Durbar ceremonies which marked King George V's coronation and hence to proclaim him as Emperor of India. The set of films, commonly referred to as the Delhi Durbar, covered the royal visit to India through December 1911, with the main ceremony taking place on the 12th. The films were first shown at the Scala Theatre in London on 2 February, at an extraordinary two-and-a-half hours (16,000 feet) in length. The films were shown around the world, bringing new prestige to the film industry and attracting new audiences to film. 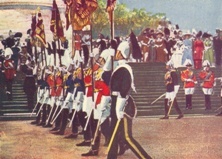 With Our King and Queen Through India is considered to be a lost film, although two reels exist, one showing a review of troops that took place after the main ceremonies and the other a procession in Calcutta from the end of the royal tour. 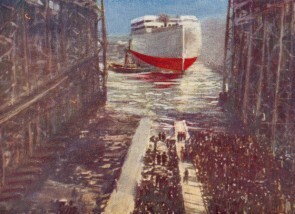 Although not produced by Urban, but rather by the separate Kinemacolor Company of America, the popular success of the Kinemacolor film of the construction of the Panama Canal was such that it was popularly held to be one of his greatest achievements when it was exhibited in Britain. The film was first shown at the Scala Theatre in London in October 1912 and at the Belasco Theatar, Washington in November 1912, a nine-reel film lasting over two hours. Today it is thought to be a lost film. Urban's launching of Kinemacolor, the world's first 'natural' colour motion picture system, fortuitously concided with a series of spectacular royal events ideally suited, with their colour, pageantry and relative lack of rapid movement (which could lead to a colour fringing effect), for showing off the new system. 1911 saw the coronation of a new King, the investiture of the Prince of Wales, and the Delhi Durbar, and - beginning this sequence - the unveiling of the Queen Victoria Memorial in London. The film perfectly encapuslated the patriotic experience, the Kinematograph and Lantern Weekly ecstatically proclaiming the film to be "the greatest piece of kinematograph work ever accomplished in the history of the industry. As an absolutely life-like representation of an actual scene it is simply superb … the whole thing is without blemish – magnificent, beautiful and inspiring". Sadly, it is one of all too many Kinemacolor films that are now lost. 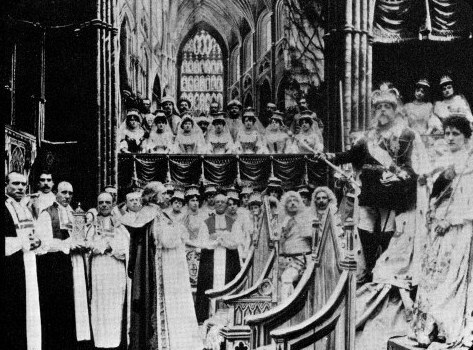 The coronation of King Edward VII in 1902 presented a problem for the film industry, because their cameras were not permitted to go inside Westminster Abbey to record the ceremony. Urban got round this problem by commissioning the French magician and fantasy filmmaker Georges Méliès to dramatise the scene inside the Abbey at his Montreiul studio in advance of the event itself. Unfortunately, the King fell ill before the ceremony could take place, which led to Urban having to shelve the film until the rescheduled coronation could take place. Although some of the onlookers in Méliès' Abbey are all too obviously his usual troupe of dancing girls, he took great pains over its realsim and faithfulness to coronation procedure. The film is a demonstration of how Urban was often happy to resort to fictional devices in his 'non-fiction' films where these suited his purposes, despite his loud advocacy for the film of fact over the imaginary film. Urban had no gift for fiction film production. His dramatic productions were generally stilted, ineptly directed, hammily acted, and hampered further by poor choice of subject. The World, the Flesh and the Devil, an improbable melodrama, was distinguished only because it was the world's first colour feature film. A pioneering mountaineering film, made by Frank Ormiston-Smith for the Warwick Trading Company in 1902. Ormiston-Smith himself led the expedition, sponsored by Urban's Warwick company, to the Swiss Alps, where they climbed (and filmed themselves climbing) Mont Blanc and Schreckhorn. The mountainerring filming is rudimentary by later standards, but in 1902 it gave audiences moving pictures of places, and altitudes, which they could never expect to witness otherwise. Released in November 1921 to coincide with the Washington Naval Peace Conference, Permanent Peace was the nearest Urban came to any overt political statement. Urban compiled an argument out of library film for disarmament and peace. Reviews of the film were enthusiastic in America, more guarded elsewhere, Britain’s Daily Herald describing it as ‘a mild form of League of Nations propaganda’. 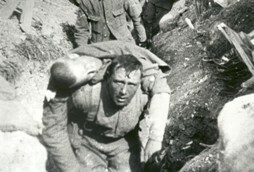 The film brings together familiar images of the war, before juxtaposing images of world statesmen, particularly those attending the conference, with their statements in the intertitles expressing their hopes for peaceful accord among nations and an end to militarism. Rhythmically, insistently edited, the film puts over its argument with evident sincerity, and as with The Four Seasons it prefigures later developments, this time in the creative use of library newsfilm. Charles Urban's last film of significance was originally produced for him by the zoologist Raymond T. Ditmars in 1923 as a workman-like history of evolution, though more of a an illustration of various forms of animal life over time periods than anything specifically Darwinian. After Urban's business collapse in 1924, the film was taken up by Max Fleischer (of later Betty Boop fame) and his Red Seal distribution company. With some stop-frame animation of dinosaurs by Willis O'Brien (of later King Kong), the film was re-edited and re-issued as Evolution; or, Was Darwin Right?, in an attempt to exploit the public interest in evolutionary theory following the sensational Scopes 'monkey' trial. The journey through the stages of man included Piltdown Man (a Fleischer addition) as it took in Java, Neanderthal and Cro-Magnon Man, until it concluded with the apex of evolution, the skyscrapers of New York (the British version showed the Houses of Parliament). A huge programme of British naval reform was undertaken from 1904 onwards, under First Sea Lord Admiral John Fisher. He introduced submarines, fast torpedo, battlecruisers, and the big gun Dreadnought battleship. Fisher also had good sense of publicity, and he was a regular visitor to Urbanora House. Urban had first built up contacts with the Navy when he was granted permission to film at Portsmouth in 1898. 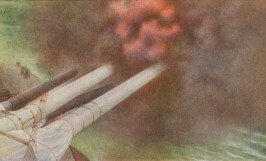 This vivid 1907 film of naval manouevres is a further expression of Urban's interest in the navy and in exploiting official connections. It is also a reflection of the dynamism of Fisher’s new navy. Although Dreadnought is the focus of the ‘attack’ on show, the real subject is the fast-moving torpedo boats (destroyers) and submarines. It gives a convincing feel of real battle action, while serving as the creative embodiment of the modern British navy. H.M. Lomas, before joining Urban as a travel cameraman, had in 1902 taken photographs which were used as prominent illustration to a book on stag-hunting on Exmoor. This came to the attention of Urban (an occasional hunter himself). Urban encouraged Lomas to take up film, and in 1904 he produced a cinematographic version of his book, a forty-part film of 750 feet entitled Hunting the Red Deer, with the Devon and Somerset Staghounds. A print of the film was recently discovered by Lobster Films of Paris and exhibited at the 1999 Giornate del Cinema Muto at Sacile, Italy. It is a dazzling, if quite horrifying, tour de force, exceptionally well shot and edited. 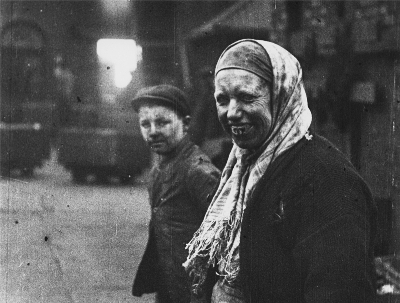 To Lomas can be credited the composition, to Urban the inspiration and the editing, which demonstrates a dramatic power and cinematic polish probably unmatched by any other surviving film – fact or fiction – of this period. The stag is pursued downstream, eventually out into the Bristol Channel, to be brought back by fishermen. "[H]e has had six years or more of good wild life, living as a king upon the wild moor, and has now given us a great run", the catalogue breezily tells us. The stag’s entrails are thrown to the hounds. It is a brilliant, appalling film. A Day in the Life of a Coal Miner is a remarkable combination of social document and unwitting anthropological exercise. Made by Urban's Kineto company, it shows the work undertaken at an English coal mine, at the coal face and the pit head. There are some dramatised sequences, such as the various family scenes, and the 'underground' sequences' were all filmed above ground, filming inside a mine being beyond the capabilities of the film equipment of the period. The film is an exceptional example of the 'industrial' genre, yet goes beyond the simple illustration of a process to show, knowingly or unknowingly, something of the human lives caught up in the remorseless round of industrial production. One of the most celebrated Kinemacolor films, made by Percy Smith. Smith filmed the speeded-up growth of various flowers – Yellow Iris, Sweet Sultan, Gladioli, Pelargoniums, Nasturtiums, and others – in an orchestrated procession of blossoming flora which elicited some awe-struck reviews. The New York Outlook found the experience almost religious: Truly when one had thus, as it were, assisted at the birth of a flower a feeling of genuine awe came over one and the thought, too, that a child who should see these wonderful things must not only have his soul awakened to beauty but to the knowledge that science brings us close to the divine. Today, speeded-up images of plant growth are a staple of practically every natural history programme. In 1910, the experience was mystical. Critics were particularly impressed by the mastery over time. ‘We see condensed in time Nature’s five hours work’ said the Daily Telegraph. A beautiful travelogue, showing various locations across Wales, including Llandudno, Conway, Llanberis Pass, Snowdon and Carnarvon, as seen by train. The film was sponsored by the London and North-Western Railway, in the hope of promoting holiday travel. Urban showed no qualms about obtaining sponsorship for his documentaries and travel films wherever he good. The result is a particularly well-filmed example of the genre, demonstrating the professionalism that was the hallmark of so much of Urban's output.